Gisèle Gravel Obituary - Haileybury, Ontario | Buffam Leveille Funeral Home Ltd.
Gravel, Gisèle Marie Lucie - With sadness the family announces the death of Gisèle Gravel at the age of 70 years. Gisèle passed away suddenly at Temiskaming Lodge, Tuesday, June 20, 2017. Born April 10, 1947 at Haileybury to the late Lorenzo Gravel and the late Lucienne Lacroix. Gisèle had been a lifelong resident of Haileybury. Predeceased by her parnets and her brother Denis. 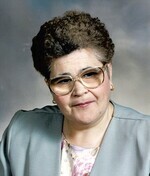 Left to mourn is her sister Lorraine Gravel of Rouyn-Noranda. Fondly remembered by nieces and nephews: Nathaniel, Marc-Éric, Stéfanie and Amélie. The Gravel family will welcome friends at the Buffam Leveille Funeral Home Thursday, June 29, 2017 beginning at 1:00pm. Funeral liturgy will follow at the funeral home at 2:00pm. Interment will take place in the family plot at the Haileybury Catholic Cemetery. Memorial contributions to the Temiskaming Lodge Residents' Fund will be gratefully acknowledged. Condolences, contributions and memorial candles may be left at www.buffamleveille.com.